How Do We Measure Super Bowl Ad Effectiveness? Well that’s another Super Bowl in the books and also another round of blow-the-budget, great and not-so-great advertising. USA Today’s Ad Meter is generally seen as the top mainstream source for answering the question, “which advertising was the best?” All 63 ads are given a simple, 1-10 rating by the Ad Meter panelists. While this is a strong and noble effort by USA Today, the challenge I have is something I’ve written about in a previous blog post which is that Ad Meter is strictly a ‘Liking’ score and doesn’t necessarily measure ad effectiveness. Effectiveness is commonly known as “did it sell the product?”. Ad effectiveness quantitative testing is generally very expensive, but there are some qualitative tools that we can use to take a stab at whether a few of these ads that were so well-liked are also effective. A = Attention – Did the ad grab my attention immediately and draw me into it for the duration? B = Branding – Did the ad clearly communicate the brand being advertised and a compelling benefit of that brand’s product or service? C = Connection – Did the ad connect with me emotionally, did it speak to a personal and/or human truth that made me identify with it? With those measures in mind, let’s take a look at a couple of the top ads by USA Today’s measure and dissect whether we think these were just well-liked or actually sold product. We’ll start with the top rated ad according to the Ad Meter, Hyundai’s “First Date” starring Kevin Hart, and my subjective A-F classroom scale ratings. A (Attention) = A. 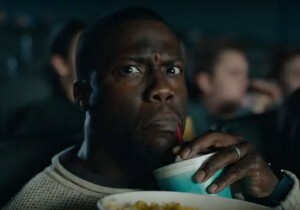 When you see Kevin Hart in the first few seconds of the ad, it’s going to get your attention. Then the romantic angle between his daughter and her would-be suitor sets us up for what promises to be an engaging storyline. Everyone at my buddy’s Super Bowl get-together was immediately drawn into this ad. B (Branding) = B+. The Hyundai car and branding as well as the benefit of “car finder” is nicely woven into the story. They are mentioned early by name and essentially the story would not be possible without these elements. Making a brand benefit integral to the story, not an aside, is best in class. The only reason I don’t give this an A is because I question whether the benefit of “car finder” is really all that compelling. I suppose we all lose a car in a parking lot for a few minutes now and then but otherwise how often will this get used? C (Connection) = A. The humor of Kevin Hart combined with the ‘young dating’ storyline that all parents of teenagers can identify with made this a great connection. Having a lengthy 60 seconds to let the story develop never hurts either. At $5 million per 30 seconds of ad time this one likely broke 8 figures = $10+ million(! ), but it appears to have been worth it. Now let’s take a look at another Top 10 ad according to USA Today’s admeter, but one that I would suggest is not as effective in selling the product. Hyundai’s ‘Ryanville’ is ranked #5 by Ad Meter and while I agree with that rating because I liked it too, I’m not as sure about effectiveness. A (Attention) = A. This ad starts off with a bang because why? Ryan Reynolds! Combined with his pretty mug and Salt N Pepa’s “Whatta Man” soundtrack, you’re pretty sure he’s the best looking man on the planet. Throw in two cute girls and then almost immediately there is another Ryan Reynolds! The first 5 seconds of this ad are killer. B (Branding) = C. Two minutes after the commercial ended did you remember that the benefit being shown in this ad was “auto-emergency breaking with pedestrian protection”? How about just ‘good brakes’? How about that this ad was for Hyundai? How about that this was an ad for a car? I don’t claim to have exceptional recall but I honestly remembered none of those things and had to go back and watch it again later to figure it all out. The car just wasn’t integral to this storyline like it was in “First Date”, it was more of an aside and if you missed the brief voiceover or the (literally) 2-second logo tag at the end then there was no way of knowing what this ad was for. One thing that struck me about this spot was that the tagline, “a car that doesn’t get distracted” and the benefit of “auto-emergency breaking with pedestrian protection” was said via voiceover. How many of us watch Super Bowls in a crowded, noisier environment? I was at a friend’s house with 5 adults and two young children. Any ad with a voiceover had about a 50% chance at best of being heard given the surrounding social volume. This one didn’t make it, and it made me think that an ad really needs to be visually explanatory to be most effective in a typical Super Bowl environment. Again it was advantage: “First Date” because I didn’t need to hear that ad to understand what it was advertising. C (Connection) = B. Ryan Reynolds connected because how could he not, he’s a former People Magazine’s Sexiest Man Alive. Along with the female foils it’s a story with a great beginning. But there was no real ending to it. The girls stopped suddenly because Ryan was in front of their car, waves all around, and see ya. That’s it? No real punchline to this one, just a bit of nice fluff. So we looked at two Hyundai ads, both rated in the Top 5 by Ad Meter, one which I would also rate in the Top 5 by effectiveness and one probably more middle-of-the-pack (among some very stiff Super Bowl competition mind you) due to some limitations, particularly on Branding. Fun stuff to think about and I salute the creative minds behind these ads. A great piece of advertising is an incredibly difficult thing to do and much rarer than one might think. These ads were approaching that air against world-class competition and one of them was truly great. Hats off to Hyundai and INNOCEAN Worldwide, the creative agency behind these efforts. This entry was posted in Advertising, Branding, Fundamentals and tagged advertising, branding, creative strategy, marketing strategy, Super Bowl on February 9, 2016 by Hugh Williams.